In an expansion of the bloody Eastern Oregon American-Indian wars that started in the 1840’s, the U.S. Military made it’s presence in the Upper Klamath Basin known by establishing and manning Fort Klamath in the Fall of 1863. 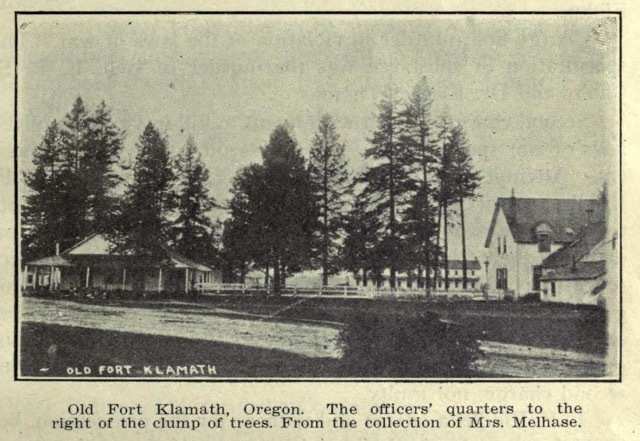 Fort Klamath located in the northeast corner of the valley, was was one of the largest Forts in terms of manpower in the entire western United States and was in service until 1889. During that time, it’s headquarters orchestrated and supplied cavalry and infantry forces to wage the Modoc War of 1872 and 1873 among other military missions. 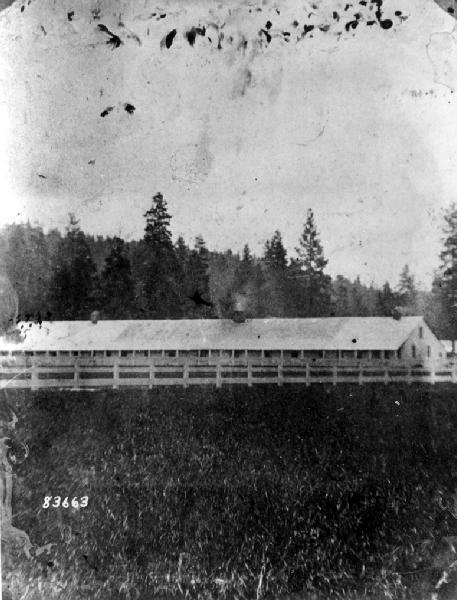 The eastern portion of Fort Klamath’s Military Headquarters lying along Fort Creek was located within the property boundary of current day Fort Klamath Ranch. 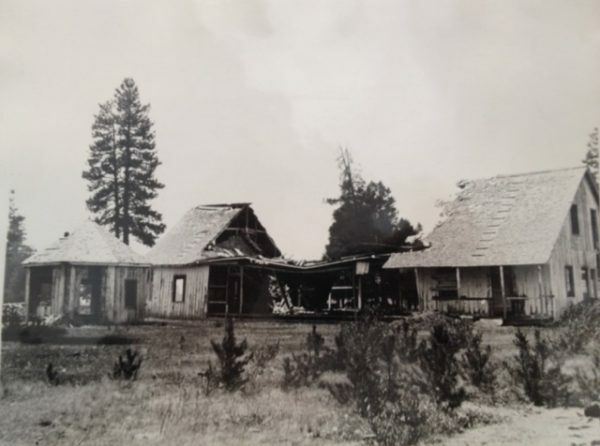 The significant buildings on the Ranch’s property included the chapel, the hotel, the opera house, homes of two master sergents, the privately operated suttler’s store and bar, as well as the suttler’s home. 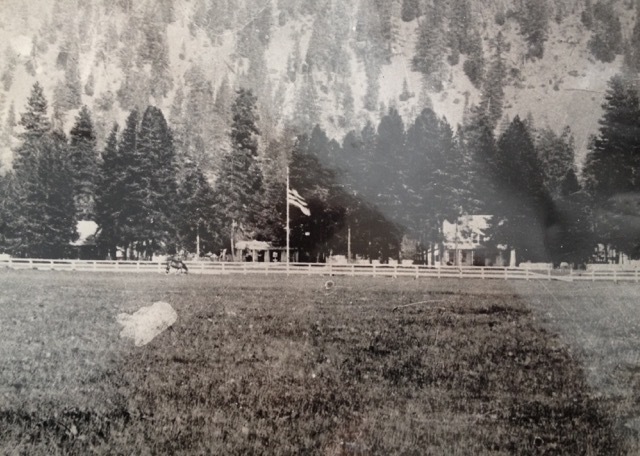 The balance of the Fort Headquarters were located immediately west of the Ranch or on the other side of what is now Crater Lake Highway 62. Klamath County’s Fort Klamath Museum is located directly across the highway from the entrance to the Fort Klamath Ranch. Following closure of the Fort in 1890, the U.S. Government deeded the land that the Fort and it’s hay reservations occupied to local tribal members who over the years sold much of it. In 1953, Mrs. Mildred Garret purchased an eighty acre parcel that now makes up the “south 80” of the current Ranch property. The spring fed meadows were often leased to local cattle families to graze cattle on while Mrs. Garret continued to enjoy the crystal clear streams. In the late 1960’s Mrs Garret was painfully aware of the Fort era “junk” that littered Fort Creek and it’s banks. So, in 1968 she retained Gary Goodson, the first family member in the area, to clean up the creek in return for having access to fish the stream during trout season. Much of the unbroken “junk” now resides in the Fort Klamath Museum across the highway as part of “The Goodson Family Collection” which was donated to the museum in 2013. 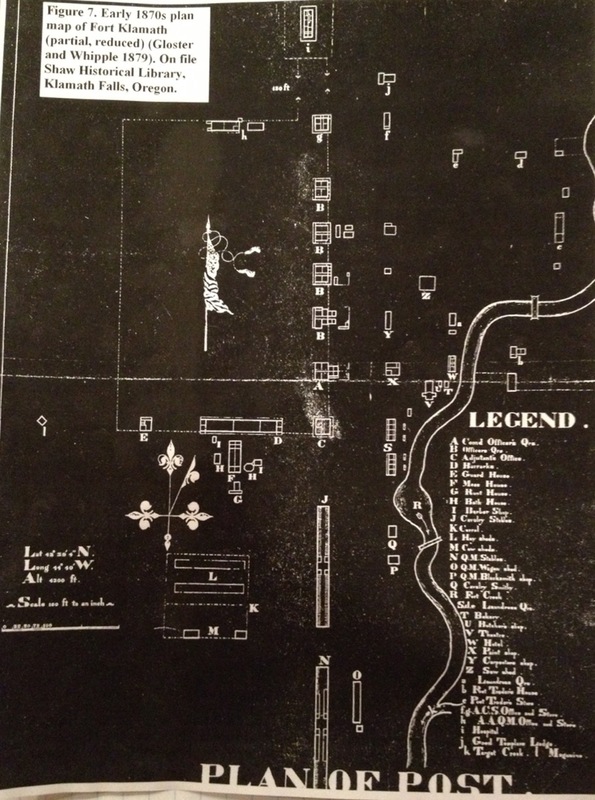 In 1974 Mrs. Garrett sold her 80 acre parcel to the Slayden Family. Their goal was to share the beauty and waters of the property with paying customers. To do so, they built six duplexes, a recreation building and dinner lodge, then promptly started the “Take It Easy Ranch” to accommodate fishermen, nature enthusiasts and hunters. In 1980, the Take It Easy Ranch was sold to the Sparicino family who expanded the operations into a thriving business that according to records could accommodate up to 200 guests a month during the summer. In 1982, the 80 acre parcel to the north of the Take It Easy Ranch was sold to Anadromous Incorporated, a privately held company that constructed a salmon hatchery to utilize the spring waters from Fort Creek. The 10 acre state-of-the-art hatchery complete with an incubation building could raise up to 150,000 pounds of salmon at a time according to the EPA permit. In 1990, Anadromous Incorporated purchased the Take It Easy Ranch to resolve some “neighbor to neighbor” issues, bringing it’s total holdings to 182 acres. Unfortunately, a downturn in returning salmon for harvest in 1990 effectively put the hatchery into mothballs after only seven years of operation. In the Fall of 1991 a breach in the earthen dam that provided gravity flowing water to the hatchery left the hatchery high and dry which it has remained for the last 25 years. In 1993, Cell Tech International Incorporated purchase the 182 acres from Anadromous Incorporated. The now larger ranch was renamed, “Rivers of Light Ranch” to recognize the two beautiful, spring fed streams Fort Creek and Short Creek that meandered through the property. Cell Tech, which harvested and produced green algea products for health food stores, utilized the cabins and lodges to accommodate company conferences and visiting guests. In August of 2012, Cell Tech and the U.S. Internal Revenue Service moved to sell the Rivers of Light Ranch to address tax issues unrelated to the Ranch. This opportunity allowed the Goodson Family to purchase and step back on to a property that carried not only great memories, but interests in timber, cattle, raising fish and the possible future development of an “event center” for things like reunions, weddings or camps. 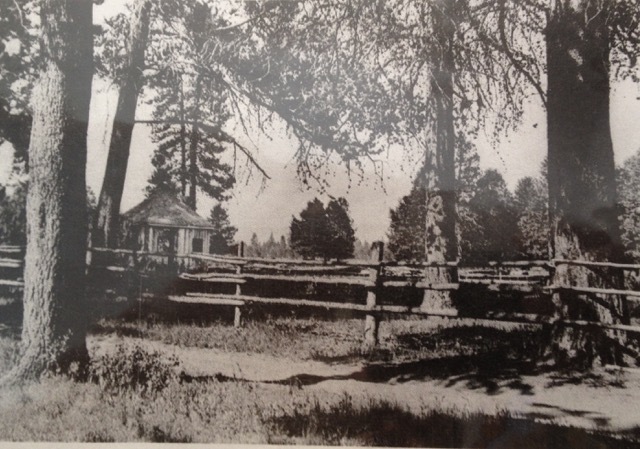 The family formed “Fort Klamath Ranch Enterprizes, LLC (FKR) and renamed the property the Fort Klamath Ranch to recognize it’s historical roots. In 2015, the Fort Klamath Ranch began it’s Wagyu Cattle operations with the purchase of it’s first 20 animals. To accommodate expanding the cattle operations further, another 140 acres was purchased nearby which began to support cattle in the Spring of 2016. In 2018, Fort Klamath Ranch Enterprizes, LLC set up the subsidiary company, Oregon Royal Fisheries to pursue the sustainable raising of White Sturgeon and other species for retail market.